Born in Sawantwadi, Maharashtra. 1956 Invited to join the Bombay Group and participated in all the shows of this group till 1962. 1976-86 Appointed as Art Director by Maharashtra Public Service Commission, Govt. of Maharashtra. 1990-91 Member, Board of Trustees, Prince of Wales Museum, Bombay. 1952 Diploma in Painting, J.J. School of Art, Bombay. 1954 27th International Biennale, Venice. 1955, 56, 59, 74, 85 Solo exhb., Jehangir Art Gallery, Bombay. 1958 Asian Artists Exhb., Tokyo, Japan. 1961 2nd Biennale de Paris, France. 1962 Indian Artists Exhb., Moscow. 1962 7th Sao Paulo Biennale, Brazil. 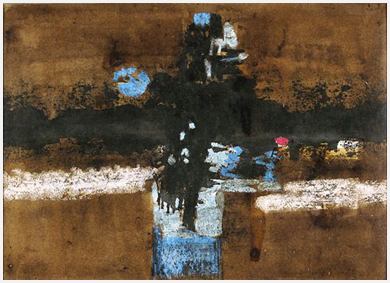 1963 Solo exhb., Gallery Art Unlimited, Providence, R.I. 1964 Solo exhb., Roopa Art Gallery, Bombay. 1965 Exhb. of Contemporary Indian Artists, organised by Lalit Kala Akademi, Nairobi, Kenya. 1965, 86 Solo exhb., Taj Art Gallery, Mumbai. 1971 Sao Paulo Biennale, Brazil. 1988 Art for Cry, Bombay, Calcutta, New Delhi and Bangalore. 1989 Nature and Environment, organised by Lalit Kala Akademi, New Delhi. 2004 Manifestations II, organised by Delhi Art Gallery, Jehangir Art Gallery, Mumbai and Delhi Art Gallery, New Delhi. 2005 Manifestations III, organised by Delhi Art Gallery, Nehru Center, Mumbai and Lalit Kala Akademi, New Delhi. Tata Institute of Fundamental Research, Mumbai. Atomic Energy Commision, Mumbai. Tata Iron and Steel, Jamshedpur. Ministry of Scientific Research and Cultural Affairs, New Delhi. National Gallery of Modern Art, New Delhi. Punjab Museum, Chandigarh. Air India, Mumbai. Cultural Institute, Panjim. Town Hall Museum, Kolhapur. Lalit Kala Akademi, New Delhi. J.J. School of Art, Mumbai. Bhau Daji Lad Museum, Mumbai. Delhi Art Gallery, New Delhi. 1952-53 Awarded Fellowship, J.J. School of Art, Bombay. 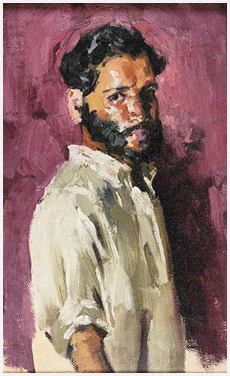 1954, 55 Award for Portraiture, Bombay Art Society, Bombay. 1956 Silver Medal, Bombay Art Society, Bombay. 1956 Award, First Bombay State Art Exhb., Bombay. 1958, 59 Gold Medal, Bombay Art Society, Bombay. 1961 Awarded Tamra-Patra and Cash, 7th Maharashtra State Art Exhb., Nagpur. 1962-63 Awarded Fulbright Smith - Mundt Scholarship by US Educational Foundation. 1977 National Award for Conception and Design of Deluxe Calender, Govt. of Maharashtra, Bombay. 1977 Gold Medal, Academy of Italy, Italy. Sadwelkar climbed the ladder of success, but he seemed to have distanced himself from commissioned portraits. He did not want his passion to be a lucrative skill. Stylistically, he was reckoning the impressionist painter and the high ideas of modern art in theory. Impressionistic in treatment, has free brushwork that creates a patchwork of colour sensations that define the subject. The brighter patches balance the dark tones in a striking manner, and the browns help establish visual continuity. Compositionally, the viewer is led from light to dark, from under the head of the painter to his eye that looks straight out, perhaps to the future. 1953-71 Taught at the Dept. of Painting, J.J. School of Art, Bombay.